Read this unbiased review of Lucky Pants Bingo to learn how to earn real money while playing free slot spins! Uh oh! It seems Lucky Pants Bingo is not available in United States. Find Similar options below. We give you an access to the latest offers from Lucky Pants Bingo! Lucky Pants Bingo has been offering thrilling Bingo games, tournaments and unprecedented rewards since its inception in 2013. With dozens of Bingo and Prebuy rooms, something special await for both new and existing players here. Beguiling new player promotions to give a starter boost are designed for new players, whereas the loyalty of existing members is rewarded in the form of unprecedented loyalty rewards. Powered by Microgaming, NetEnt, Play’n GO and an assortment of other online gaming software providers; Lucky Pants Bingo offers an array of unique Bingo games including 75-Ball, 90-Ball and 5 Line Bingo games. Apart from a huge list of Bingo games, this Bingo brand also offers a gamut of Slots, Card games, Table games and Scratch Cards. By using the latest SSL technology, Lucky Pants Bingo renders a safe and secure gaming environment. Also, this Bingo brand is certified by Alderney Gambling Control Commission. It also holds a remote operating license from the UK Gambling Commission operating in the UK market. So, it’s time to stake your real money by dropping all your worries aside pertaining to safety and security. 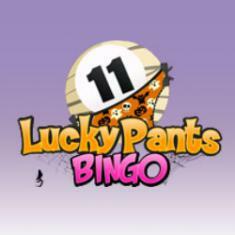 Along with an invincible instant-play and download-able version, Lucky Pants Bingo also has a mobile version, which can be accessed by downloading the official app of this Bingo brand. Players can download the app on various mobile devices including iPhone, iPad, Android, Windows and Blackberry. Lucky Pants Bingo is powered Microgaming, NetEnt, Play’n Go, IGT (WagerWorks), WMS (Williams Interactive), Realistic Games, Eyecon, SG Gaming and Core Gaming. All these online gaming software together make Lucky Pants Bingo more than just a Bingo destination. Core Gaming. All these online gaming software together make Lucky Pants Bingo more than just a Bingo destination. Do you intend to unfold the thrill of Slots and Bingo games all at one platform? If yes then Lucky Pants Bingo is the place to be as this bingo site offers an assortment of Slots machines and Bingo rooms filled with cheeky sense of humour. Below you can access a comprehensive guide to the gaming lobby of Lucky Pants Bingo. Lucky Pants Bingo is home to an exciting and thrilling range of 75-Ball, 90-Ball and 5 Line Bingo games. A new Bingo game is played every 3 to 5 minutes and a new ball is called every 3 seconds. 75 Ball Bingo is the most popular variant of Online Bingo and is the most favourite form played in the United States. With a Bingo card in the format of 5X5 chart of numbers, the word BINGO appears on the top of the card and each column of numbers is placed under an alphabet. The B column contains 5 random numbers ranging from 1 to 15; the I column contains 5 random numbers ranging from 16 to 30; the N column contains 4 random numbers (with one blank space in the center) ranging from 31 to 45; the G column contains 5 random numbers ranging from 46 to 60 and the O column contains 5 random numbers ranging from 61 to 75. Endless winning patterns can be formed in a 75 Ball Bingo game. 5 Line Bingo which is also known as Swedish Bingo is played on a 5X5 Bingo card pattern, where random numbers appear ranging from 1 to 75. The Turbo Bingo game is wrapped up within 2 minutes as in this one, the bingo balls are being called out every second. Players playing this one have to be really quick and responsive while playing as it's so fast-paced that we're pretty sure it would be counted as mental exercise. Apart from an exhaustive collection of Bingo games, you can also enjoy some of the best Slots machines at this gaming platform. Whether you are a novice spinner or a veteran spinner, there's at least one Slots game to fit in your preference and mood. After reviewing hundreds of online casinos, poker rooms and bingo sites, we've never seen such an organized Slots lineup ever before. With bifurcation under three main categories – Features, Paylines and Themes; you get to spin the reels of a wide collection of Slots games. Some of the most popular titles are Cash of Kingdom Slot, Jumanji Slot, Lost Relics Slot, Zombies Slot and Lucha Legends Slot. With different variants of Online Roulette, Online Blackjack and Online Poker, witness the magic of tables and cards at Lucky Pants Bingo. In collaboration with Realistic Games, this Bingo site offers premium versions of Blackjack and Roulette – Hi Lo Blackjack, Three Card Poker, Key Bet Roulette and Blackjack Perfect Pairs to name a few. Before heading to the 'Scratch & Arcade' section of Lucky Pants Bingo, put on your lucky pants as you can win up to £250,000 with the wide selection of instant-win Scratchcard and Arcade games offered by this site. With such a wide selection of games, we are pretty sure that you are going to have an amazing gaming adventure at this platform. Happy playing, amigo! The Bingo mascot of Lucky Pants is all set to offer its Bingo enthusiasts a 200% Bingo bonus. Betty’s partner in crime, Luke Pants is offering a 100% Slot bonus. 2nd and 3rd Deposit Offers, it’s time to accumulate some Bingo or Slots funds. Following offers are available to a new player on making the 2nd and 3rd deposits. Choose wisely, amigo! Make your Wednesdays better with the Win-Win Wednesday promotion of Lucky Pants Bingo. All you need to do is prebuy your risk-free cards, sit back and WIN-WIN! This Bingo room opens at 10 pm UK Time on every Wednesday, where you either get to pocket a share of £200 or get your money back. With the Fiver Frenzy promotion of Lucky Pants Bingo, every player is up for winning 5 times per game everyday, twice a day. The Fiver Frenzy prebuy room opens at 1 pm and 10pm everyday. So, put on your lucky pants and head to Fiver Frenzy prebuy room. Here's one more promotion designed to give a boost to the bankroll of a newbie. The Bonus Booster prebuy game gives you an opportunity to win 5 massive deposit bonuses for just 1p. Bear in mind that it is available only to first time depositors. Lucky Pants Bingo is going to add a puff of mystery to your Bingo gaming experience. To unravel this mystery; all you need to do is sit back and grab some cards, participate in the game and win! The Pandora's Mystery Box room opens at 9 pm every Thursday night. Monthly 50p Game: Seeded at £100 Game plays every 2nd last Friday of the month at 9:00pm. Every Tuesday evening at 22:00 UK Local Time, you get to go on a shopping spree and shop till you drop. The cost per ticket for this shopping spree is 5p and you can buy a maximum of 72 cards. The winner enjoys a prize of £100. Under the Lucky Club of Lucky Pants Bingo all the loyal players of this bingo site are rewarded. For every real money wager that you put at this bingo brand, you earn loyalty points which are further redeemable for an upgrade bonus, daily free cards, daily free spins, free bingo, exclusive and dedicated VIP managers, VIP cash bingo games and what not! Thus, quickly head to Lucky Pants Bingo and register to avail all such lucrative bonuses and promotional offers. To start your gambling journey at Lucky Pants Bingo, selecting a gaming device is substantial. You can choose either your MAC / PC, iPhone, iPad, Blackberry, Android, Windows or Mobile gaming device to begin your play. To play unique Bingo games and avail all the thrilling promotions and unprecedented loyalty rewards, you need to create an account with Lucky Pants Bingo. To do the same, visit Lucky Pants’ website and click on ‘Join Now’ button. Post that, you’ll be asked to fill in a couple of personal details. Accurately fill in all the details and you are all set to wager your real money here, at Lucky Pants Bingo. Post creating an account and grabbing the Signup Freebies, it is mandatory to make a deposit for continuing your game play at Lucky Pants Bingo. Grab various Welcome and Match Deposit Bonuses to make the most out of your deposits. Once you are done with all the above mentioned steps, you are all set to stake your real money for some fun, thrill and adventure. May the odds be in your favor. Good Luck! This is undoubtedly the best online bingo site. It's been a few month since I joined Lucky Pants Bingo n ever since, I know I have a great place to unwind after a hectic day. A variety of bingo rooms are available n the casino gaming selection is huge n versatile. Decent number of bonuses n promotional offers are given away by the site. I have met some new people in the bingo rooms of Lucky Pants. By n large, I'd rate this site 5 on 5. Please enter your review for the Lucky Pants Bingo.